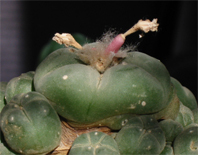 A while ago professor Martin Terry, a botanist at Sul Ross University in Alpine, Texas and the authority on Lophophora, appeared on the Cultural Baggage radio show talking about the peyote cactus. Below you find excerpts from the transcript of this very informative radio program. You’re heading in the right direction but I’d like to make a couple of tweaks in the way the situation is described. It’s basically, peyote is not considered an endangered species, yet. It’s a very patchy situation. In other words, on those large ranches with ten foot fences around them to keep deer in, trophy deer, which is their main business and to keep people out, on those ranches where there’s no harvesting going on of the peyote, the populations are quite healthy. There’s plenty of peyote there and they’re nice mature adults but once you get outside of that subset of large protected ranches then you find, everywhere where the licensed peyote distributors have access, there the populations are being hammered. And it’s essentially a problem of too frequent collecting to maintain sustainability. Dean Becker: Kind of like the way they’re getting all the fish out of the ocean. Professor Terry: Very much so. They’re just going back to harvest before adequate reproduction and growth has replaced those ones that they harvested last time. That’s a very good analogy, the one to the over-harvesting of the oceans. There are three DEA registered distributors of peyote who have a license, which they pay a license fee for, to send their people out to harvest peyote which then, they will sell to members of the Native American Church who have their papers to show that they’re bona-fide Native Americans who are going to use the peyote in their religious ceremonies. But that’s not the only way that peyote gets harvested. There’s nothing in the laws to prevent a duly registered Native American tribe member, member of the church, to make a contract with a landowner directly so that, in that situation, the licensed distributors are not involved. That never gets accounted for and we have to assume that’s a sizable number of peyote plants that get harvested that way. And that never gets accounted for in the official statistics on peyote numbers and peyote sales. [...] there’s been a change in land tenure over the past few decades. Whereas if you looked at the people who owned most of the land, say in the 1950s, you would have found that most of the people who owned the land were actually living on the land and were making a living from ranching. That is no longer the case. Now much of the land in South Texas, at least the larger tracts, are owned by people who have the money to afford such tracts now, which means they’re not living in South Texas. They’re living in Houston, Dallas, Austin, San Antonio where the money is made. Their primary interest is to use these tracts for the hunting of trophy deer. And that’s how they make any income, any real income that they make. Cattle would be only for the tax exemption. The people like that are not going to be at all interested in allowing unknown people to be coming onto their land to harvest the peyote there for a few hundred dollars a year. I mean, that’s absurd. That’s totally uninteresting to the new landowners. [...] if you look at what’s been happening to the [peyote] sales over the last twenty years, and these are public figures, they are readily available, you see that the number of peyote buttons harvested by the distributors and their agents has fluctuated over the last twenty years. It went up over two million buttons a year during, let’s say the early 1990s, and then came down again. And now it’s as low as it’s been historically. It’s down right around a million and a half buttons per year but the price, the total sales in dollars for those million and half buttons, it’s just under $500,000. So that comes out to, yeah, a little over thirty cents a button. Peyote is still too cheap when acquired through legal channels and that’s one of the problems when you get to the field because the guys who go out to harvest for the licensed distributors, they’re just interested in beer money and they will harvest these things in a willy-nilly way, not taking care at all because what are they going to get? They’re maybe get ten or fifteen cents when they sell the buttons to the licensed distributor who ‘employs’ them. And so they don’t have anything invested in taking care of the peyote crop. It’s cheap, it’s just beer money, they want to harvest them as fast as they can, sell them and go buy their beer. Dean Becker: Yeah. The point being that if it’s done carefully, leaving the root, that the plant can in fact grow back, right? Professor Terry: It can indeed. Now, to what extent that happens is a very live question. If you talk to people who have a vested interest in the peyote trade then they’ll say ‘Oh yeah, you cut the top off and in two years you’ve got another harvestable plant.’ That’s a gross exaggeration. You cut the top off and, first of all, you don’t know what percentage of the plants are actually going to survive that decapitation. And it’s weather dependent. If people come along and harvest a ranch and leave the cut tops exposed and then you have this big rain you can get a lot of infection in those plants and they’ll just die. They’re not going to produce anything ever again. So that’s one factor. On the re-growth side, even those that do re-grow I dare say, from what I can gather as a botanist, you’re not likely to see a harvestable button until about five years after the first harvest. So that re-growth, two things are happening. First of all, they’re going to be smaller stems that grow back from the once harvested plant and secondly, it’s going to take a long time for them to get to harvestable size. And the fact that people are coming back after two years to re-harvest again they’ve got to be harvesting buttons that are much smaller than the average adult size. And this is one of the things that you see in that marketplace. You see that there’s been a constant decrease in the size of buttons, certainly, over the past ten to fifteen years. And so now, even though the price hasn’t gone up dramatically, it’s gone up sort of linearly and quite slowly, but if you figure in the fact that the buttons that are costing thirty cents apiece are perhaps one fifth to one tenth of the weight of what the buttons used to be at, say, when they were ten cents apiece...the price has gone up astronomically. Dean Becker and Martin Terry discuss several other interesting issues including proposals for supplying the Native American Church with sufficient amounts of peyote. These proposals range from increasing the rate of peyote production in situ (by fertilizing natural populations) over greenhouse cultivation to whether the importation of peyote from Mexico is a feasible solution to the problems of the Native American Church of North America (Terry says no, it would basically just extend the problem with over-harvesting from Texas into Mexico). You can read the full transcript at the Drug Truth Network or download the radio show (13.3 MB). This problem of over harvesting can be fixed by massive cultivation of Lophophora and Trichocereus cacti!!! P.S.-Consider joining Peyote Way Church of God!